It’s official: the Democratic Party will gather in the Midwest to nominate its next standard bearers for President and Vice President of the United States. The Democratic National Committee announced today that Milwaukee – Wisconsin’s largest city — will host the Convention from July 13th-16th, 2020. The convention’s anticipated four general sessions will take place at the newly-built Fiserv Forum, where the NBA’s Milwaukee Bucks play, while additional activities like caucus and council meetings will take place at nearby venues, like the Wisconsin Center, UW’s Panther Arena, and Miller High Life Theater. The 2020 Democratic National Convention will be the first held in the Midwest in decades, and the first held in a Midwestern city other than Chicago in over a century. It will be Wisconsin’s first ever major party convention, as well. “Milwaukee will be ready to host a tremendous experience for all of our visitors and residents,” Milwaukee County Executive Chris Abele said. The 2020 DNC is expected to cost over seventy million dollars to stage. As Perez said, Milwaukee was chosen over two southern cities, Houston and Miami, which had also been named finalists by the Democratic National Committee. A major logistical strength of Milwaukee’s bid was that it had a brand new arena to offer as the centerpiece of its pitch — the aforementioned Fiserv Forum. The 730,000 square foot Forum is so new that it had yet to open when Perez and top Democratic Party officials toured it last year. It can accommodate 17,341 people for basketball and 18,000 people for concerts. The lower bowl seats 10,000. It was built with thirty-four suites, six loading docks, 300,000 pounds of rigging capability for events, ten elevators, ten escalators, more than 9,000 LED light fixtures, and thirty-four large public restrooms — nineteen of which are for women. There are eight hundred high definition televisions in the arena as well. An enterprise-level network of Wi-Fi hotspots provides fast, free high speed Internet. Skeptics of Milwuakee’s bid have questioned whether the city has enough hotel rooms to accommodate thousands of delegates, media representatives, VIPs, guests, and volunteers. The city’s organizing committee is confident it does. “We have enough hotels,” Milwaukee 2020 Chair Alex Lasry said in response to comments about the Brew City’s capacity to lodge guests. Thankfully, seven new or renovated hotels are due to open in downtown Milwaukee before the convention occurs, increasing downtown’s capacity by over ten percent. “The hotel community came together and said, ‘Look, we got to make this happen. And the way to make this happen is to commit all of our rooms to this,'” said Greg Marcus, President & CEO of the Marcus Corporation, which is allotting all of its hotel rooms for use by people coming into town for the convention. “The heavy lifting, I think so far has been really getting ready and trying to convince, and teach and educate the Democratic National Committee that we had the infrastructure that we had the hotel rooms, that we have the event space, that we have the things they need,” Marcus added in remarks reported by WISN. Although Miami mounted a spirited effort to secure the Convention, Perez ultimately settled on Milwaukee. It couldn’t have hurt that Perez’s wife is from Wauwatosa, Wisconsin… or that the couple were married in Milwaukee… or that one of their daughters attends the University of Wisconsin at Madison. Houston’s bid was significantly hampered by a labor dispute between the city’s Democratic mayor and its firefighters as well as glaring financing problems. Houston’s major industry is fossil fuels and party officials were not keen on a 2020 Democratic National Convention financed with oil and gas money. Milwaukee also has an advantage over Miami and Houston with respect to its summer climate. Its average July high is 83 F; its average July low is 63 F.
Where the Brew City really shines, though, is its lower dew point. Miami and Houston both have the exact same average dew point in July… 74 F. Milwaukee, on the other hand, has an average July dew point of just 61 F.
Because dew point is the best indicator of comfort out-of-doors. It’s “the temperature to which air must be cooled at constant pressure and water content to reach saturation”. When the dew point gets above sixty-five degrees or so, it starts to feel pretty muggy and sticky. Everyone’s comfort level is different, but there’s no denying that when the air is loaded with moisture, it’s harder to perspire. 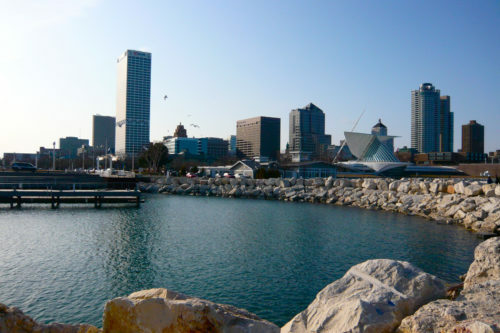 Milwaukee sits at a latitude similar to that of Roseburg, Oregon, and Boise, Idaho. Seattle and Portland (Oregon) enjoy a long distance rail link with Milwaukee thanks to Amtrak’s fabulous Empire Builder, while Alaska and Delta each offer one daily nonstop flight in each direction between Seattle and Milwaukee. No nonstop service between Milwaukee and other Northwest cities is available from a major carrier. In light traffic, Milwaukee is about a thirty and a half hour drive (1,946 miles) from Seattle via Interstate 90 and Interstate 94. A road trip from Portland to Milwaukee takes longer because Interstate 90 follows a more northerly alignment. A road trip from Boise is quicker because the cities are about at the same latitude and two reasonably direct routes are available to the motorist. Wisconsin will be a battleground state in 2020. Wisconsin had been in the Democratic column for decades before Hillary Clinton narrowly lost it to Donald Trump. Democrats are anxious to reclaim Wisconsin as a blue state in 2020. The party took a major step towards that goal last year by finally vanquishing former governor Scott Walker, who was defeated in his reelection bid by Tony Evers. The Republican Party will host its 2020 National Convention in Charlotte, North Carolina, from August 24th-27th — more than a month after the DNC. Charlotte previously hosted the 2012 Democratic National Convention seven years ago.